An Overview: Mountain Trail Rides is located at 255 Freeland Road in Canaan Valley, just .25 mile off of Route 32, less than five minutes from Canaan Valley Resort State Park and Timberline Four Seasons Resort. Other nearby attractions include the Canaan Valley National Wildlife Refuge, Blackwater Falls, Dolly Sods Wilderness Area, Spruce Knob, Seneca Rocks, Seneca Caverns, Smoke Hole Caverns, the Durbin & Greenbrier Valley Scenic Railroad, Cass Scenic Railroad, the National Radio Astronomy Observatory at Greenbank, and Deep Creek Lake in Maryland. 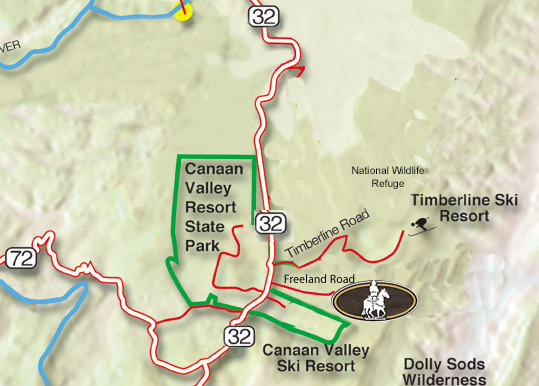 DIRECTIONS: On Route 32 in Canaan Valley, between Canaan Valley State Park and Timberline Ski Resort is Freeland Road. Head East on Freeland Road for .25 miles and we are on the left.